The metallic blue of our ZBGB1BL stand up pouch offers a unique look for retail food items. 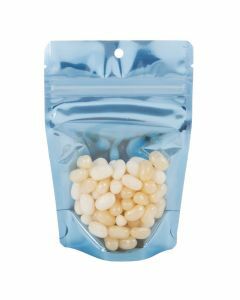 This pouch is designed with a blue interior, a blue back panel, and a clear front panel to show off your product. 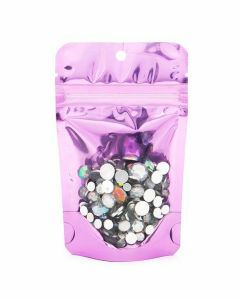 The pouch measures 3 1/8" x 2" x 5 1/8" and holds 1oz/28g. Package coffee, candy, sprinkles, nuts, and more. Features include tear notches, a resealable zipper, and a round hang hole for retail display. 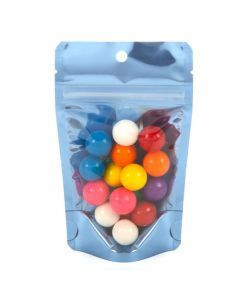 Our Brilliant line of stand up zipper pouches offers a bright and shiny look for retail products. 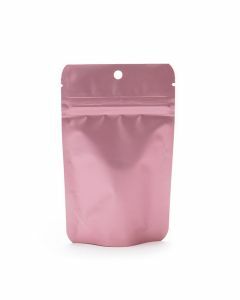 The ZBGB1PC pouch is designed with a clear front panel, a peach back, and a peach interior. 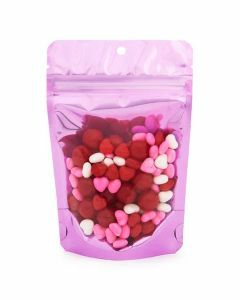 This resealable pouch measures 3 1/8" x 2" x 5 1/8" and holds 1oz/28g of coffee, tea, mints, candy, nuts, and more. A high barrier keeps products fresh. 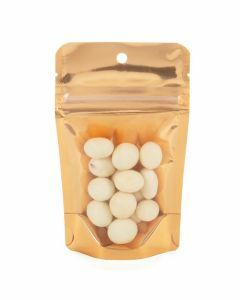 Showcase your product in style in our ZBGRG2 metallized rose gold stand up pouch with a clear front panel. This flexible pouch measures 4" x 2 3/8" x 6" and holds 2 oz/57 g of dry goods. Features include an airtight zipper closure, tear notches, and a round hang hole. Package small portions of coffee, nuts, sea salts, snacks, and more. 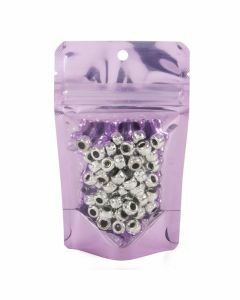 Add a touch of sparkle to your product display with our Brilliant line of food grade zip pouches. 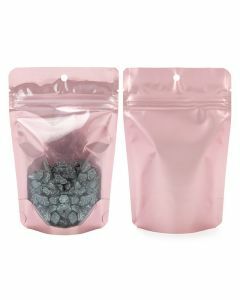 Our ZBGB2PK pouch measures 4" x 2 3/8" x 6" and holds 2oz/57g. 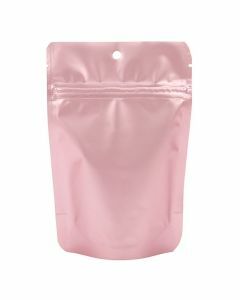 The pouch is pink inside with a pink back and a clear front. 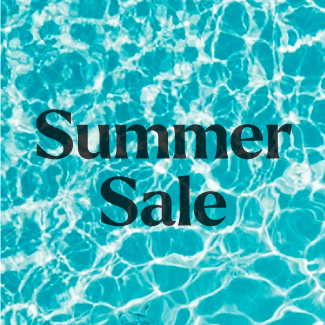 Package bath salts, candy, jerky, and more. 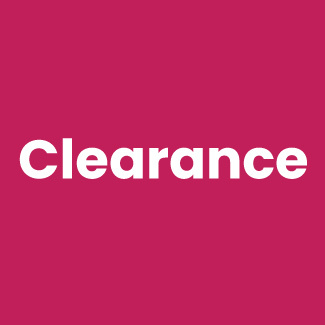 Features include a resealable zipper, tear notches, and a round hang hole for retail. Attract a crowd with this stand up zipper pouch in metallic blue. ZBGB2BL has a clear front, blue printed back and is blue inside. This 4" x 2 3/8" x 6" pouch holds 2oz/57g. Package coffee, cookies, candy, bath salts, and more. 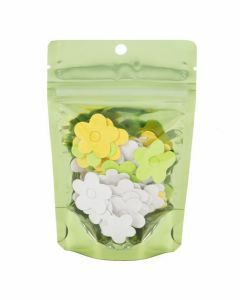 This durable 4 mil pouch is laminated and features a round hang hole, tear notches, and a resealable zipper. Food safe.